Richardson Electronics is a world leader in replacement laser lens distribution. Our CO2 laser optics are made by the best manufacturers in the business, and are available at competitive prices. Our lenses deliver the same high levels of performance as OEM lenses to keep your laser operating at the peak performance. From the raw materials to the finishing processes, they are manufactured to meet the highest standards for quality. All of our CO2 laser optics are made from high purity materials to ensure maximum light transmission with low levels of absorption. They feature superior coatings to prolong working life and improve performance. Richardson Electronics' laser lenses are crafted by trained, experienced technicians utilizing state-of-the-art precision equipment to assure tight tolerances. Perfect fit and compatibility with your laser machine are guaranteed. We have CO2 laser optics for machine models from all major laser manufacturers. Richardson Electronics has a wide range of replacement laser lenses available. We offer both standard and low absorption lenses. All diameters, focal lengths, and edge thicknesses are available to match the requirements of any make and model. Our extensive inventory of CO2 laser optics makes it easy to find what you need in the quantity you require. 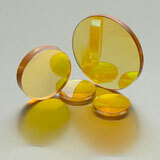 Low absorption lenses absorb up to 50% less of the laser beam energy than standard absorption lenses. Low absorption lenses are less affected by thermal lensing, thereby, providing higher focusing stability. Low absorption lenses tend to be easier to clean due to their tough top coating. Low absorption lenses tend to last 1.5x to 2x longer than standard coated lenses, due to the reduced rate of absorption, which slows thermal breakdown. The above benefits are realized on lasers that are ≥4kW in power! There are no benefits in using low absorption lenses in lasers that are <4kW in power!